With the sun shining on a beautiful January morning we travelled north for today’s tour which was based around the area of the eastern lower Galilee, a small area which roughly speaking is encircled by the roads 71, 90, 85 and 65 (for those trying to locate it on a map). It is considered distinct from the central Galilee due to its geological make up – steep basalt cliffs formed by ancient volcanic activity (vs the sedimentary rock of the rest of the Galilee region). 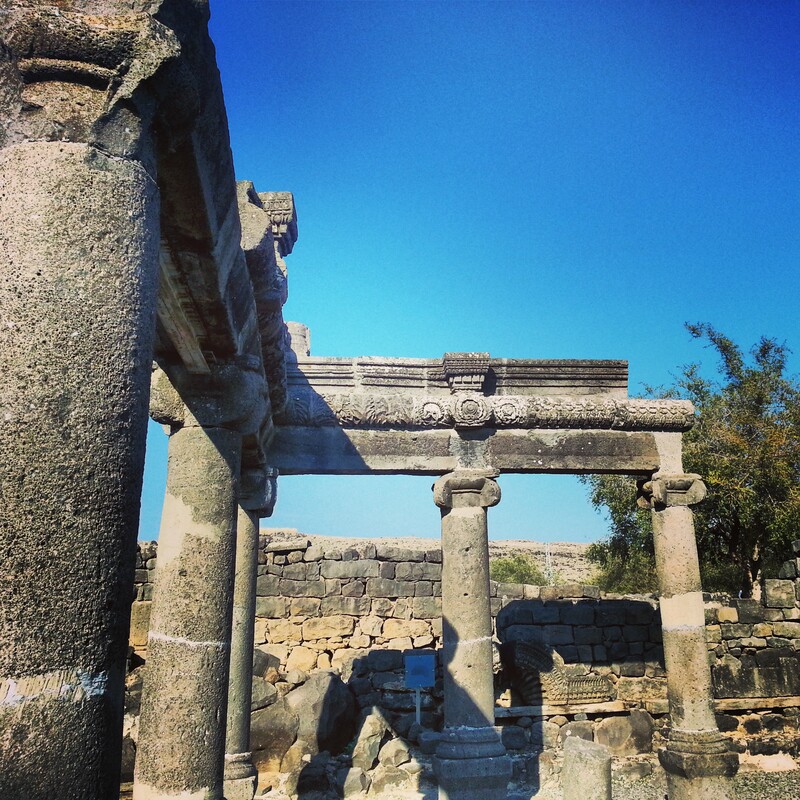 Our tour today was to be quite varied – as we get towards the end of our time on the course, some of our trips consist of us fitting in some of the sites that we have not yet had a chance to visit despite passing close by (for example during our trips to Tiberias or Christianity around the Sea of Galilee). We began the day at Mount Arbel, an imposing basalt mountain with a sheer cliff face leading down to the Sea of Galilee. A short walk took us to a stunning viewpoint over the area and our guide helped us locate various sites of interest. We then heard the story of the town Arbel (located close by) during the Jewish revolt against Herod (recently made ruler of the Galilee) in the 1st century BCE. The Jews were soon overwhelmed and hid in caves hidden in the cliff face. To overcome this problem, Herod’s army constructed cages and lowered soldiers down to the caves where the rebels were sitting ducks. Many of them threw themselves to their deaths rather than be taken prisoner. A short drive took us to the ruins of the Byzantine town of Arbel where it was possible to see the remains of their synagogue. 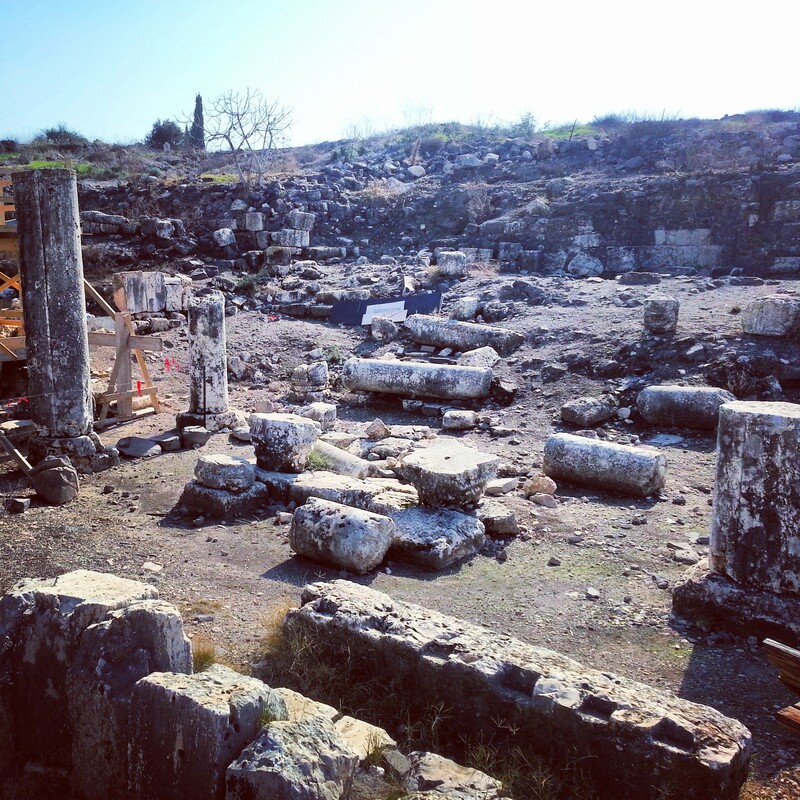 There are many ancient synagogues around the Galilee and Golan (the oldest going back 2000 years) and we learned different theories as to the dating or provenance of different styles of construction. We then headed west, passing the Horns of Hattin (site of the famous battle in 1187 when Saladin vanquished the Crusaders) and arriving at Nabi Shu’aib. 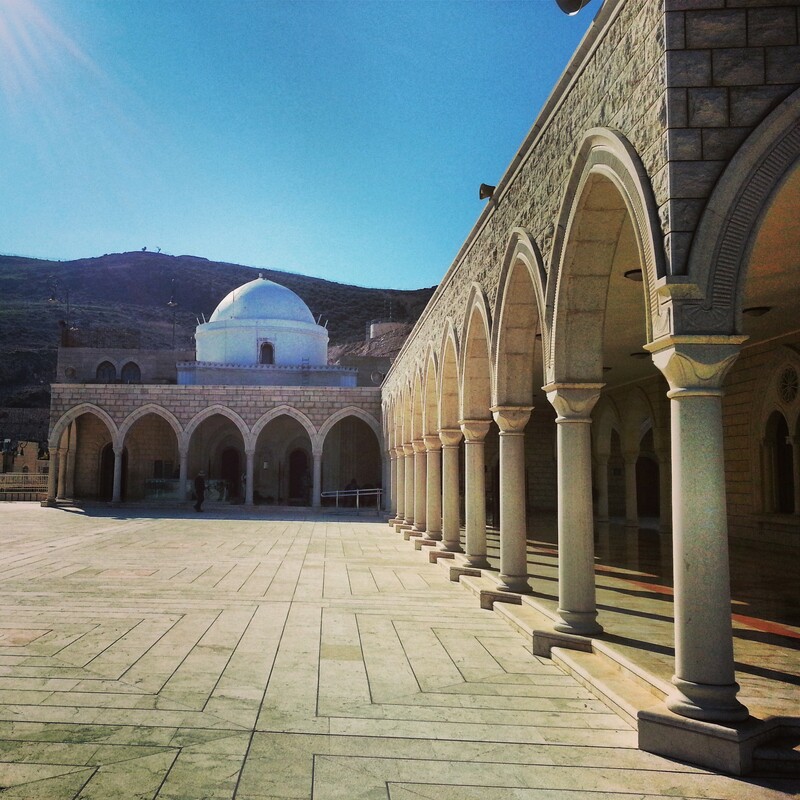 The holiest site for Israeli Druze, it is considered to be the tomb of Jethro, father-in-law of Moses. The tomb complex is now run by Druze although Jewish and Muslim pilgrims (for whom Jethro/Nabi Shu’aib is also a holy figure) are welcome to visit too. It was a nice stop; the Druze were very welcoming and there were lovely views through the Arbel cliff to the Sea of Galilee. Travelling north, our next stop was at the ruins of ancient Korazim. The earliest source about this site is the New Testament, when Jesus curses it for refusing to heed his teachings. Excavations in the 80s have unearthed most of the Byzantine period settlement, including a large synagogue dated to the 5th century. Interestingly, the synagogue contains some pagan symbols (including an image of Medusa, the character from the Greek myths). This is not unusual in synagogues of the Golan (Korazim is not in the Golan but is very close) where it seems that in later centuries some of these symbols were absorbed as by this time they had become simply decorative, without religious meaning. A short distance away was the site of Domus Galilaeae. 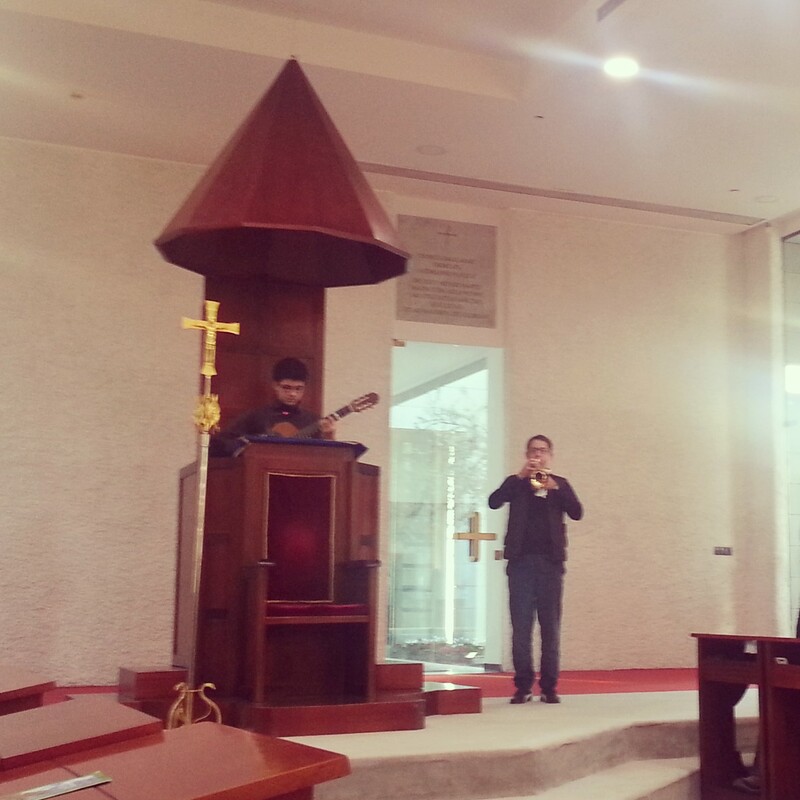 Opened by Pope John Paul II in 2000, it is a place for young men training to be Catholic priests to come for a period as part of their studies. The centre focuses on understanding the Hebrew and Jewish traditions of the early Christians who were based in the area; an idea that to live authentic Christianity one must understand its Jewish roots. Students study Hebrew and engage in interfaith dialogue. The building is beautiful and has a stunning view over the Sea of Galilee. We were also treated to a concert by some of the students who sang for us in Hebrew. Our final stop of the day was at Tel Mutilla, located in the modern village of Almagor. We learned about the 1949 ceasefire agreement with Syria following the War of Independence, and the ensuing complications in three ‘demilitarised’ zones where the interpretation of ‘demilitarised’ was disputed. Visiting the memorial to the soldiers who died in an unexpected battle with Syrians in 1951 (which fortunately did not escalate further), we enjoyed the sunset over the Sea of Galilee before heading home to Tel Aviv.